I think I’m going to UPDATE this blog until I’m blue in the face. There’s more blogs about this race coming out every day. Let’s show the power of the higher ed community! Friday Five: Go #MBTeamS Go! content + connectivity: analyzing the brand of @tsand. The Tweet Race: Epic Fail for Mercedes, or Failing Like a Fox? Two epic battles occurred in the past week: one on Twitter and the other at the Super Bowl. On Twitter, “Team S” (hash tag #MBteamS) was racing against 3 other teams in the first-ever Twitter-fueled race sponsored by Mercedes-Benz. 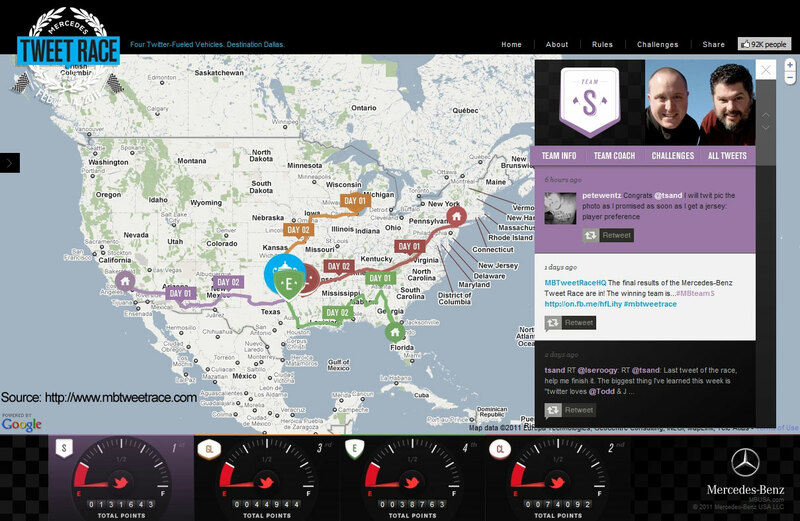 Team S drove a 2011 Mercedes-Benz S400 coupe from Los Angeles to Dallas, while the other teams drove from Chicago, New York, and Tampa. During the 3 day race, the teams and their Twitter followers accumulated points by completing challenges. The team with the most points won. Even as I write this, a day after the Super Bowl, both topics are still smoldering on the Internet; still trends on Twitter. Well, the short story is that both MB Team S and the Packers won. MB Team S amassed 131,643 points! That was more than the combined points of the 2nd (74,092) and 3rd (44,944) place teams. The Green Bay Packers won the Super Bowl 31 to 25; they never trailed. So how did they win? Promotion. Todd Sanders (twitter user name @tsand) and John Pederson (@ijohnpederson) were the drivers for Team S. They won the chance to drive in the first ever Twitter-fueled race from a promotion Mercedes held back in late 2010. They, along with their coach Pete Wentz (@petewentz), promoted the race from day one. They were the underdogs according to Twitter follower statistics. Todd works for University of Wisconsin, Green Bay, John works for WiscNet, Madison, and Pete is a famous musician (bassist for Fall Out Boy). First, the race was a promotion for Mercedes-Benz. They are developing a new line of cars in the coming years and they want young people to drive them. Somewhere in the recent past they must have lost that demographic. This was the first time the luxury automaker has advertised at the Super Bowl. Second, the race was a promotion for donations to the charities of the coaches. Pete’s charity was St. Jude Children’s Hospital. Mercedes donated $45,000 to the winning team’s charity. Todd and John, additionally, raised over $5,000 from their friends, followers, and the social network community. Third, the race was a promotion of social media, or, more accurately, the power of social media. Through crowd-sourcing, Todd (it was mainly Todd) was able to reach out to the people that follow him on Twitter and Facebook, and they in-turn reached out to their followers, and so on. 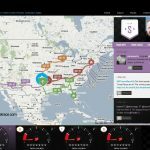 With that number of people, most of whom are proficient users of social media, Team S was able to keep their car “full” of tweets – from start to finish – each day. UPDATE: As the number of references grows, one can really begin to see the power there is in social media, and the influence one man can have on an entire community. Todd even had the cojones to visit us at HighEdWeb 2010 from his home via videos, tweets and pictures; he’s that good.